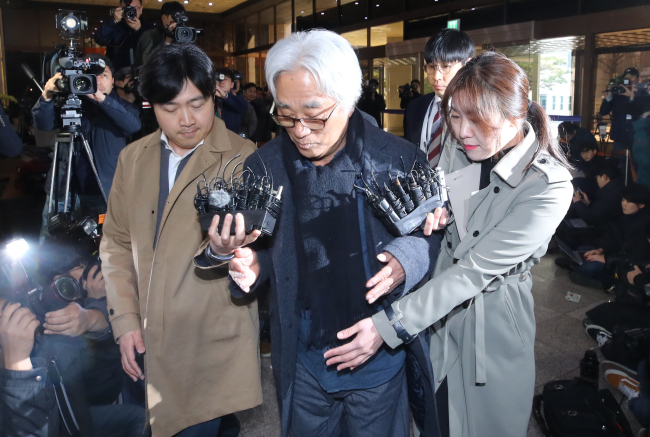 Police questioned Lee Youn-taek, a disgraced theater writer and director, for two consecutive days over the weekend over alleged sexual violence against female junior members of his drama troupe. His appeared at the Seoul Metropolitan Police Agency on Sunday morning, hours after he returned home at 1:10 a.m. following a 15-hour interrogation. The 66-year-old Lee is one of the high-profile South Korean men to fall over sexual misconduct as the "Me Too" movement quickly spreads in the country. After arriving at the agency around 10:24 a.m., Lee said, "I'm giving testimonies in accordance to what really happened," when asked whether he admits to the allegations. He is suspected of having sexually harassed or raped more than a dozen female junior colleagues using his superior status from 1999 to June 2016. After Sunday's interrogation of Lee, the police are expected to make a decision on whether to seek a warrant to arrest him. After the police interrogation earlier in the day, Lee offered a fresh apology to the victims and promised to cooperate in the probe. Asked whether he listened to the victims' testimonies, Lee told reporters: "I don't know about them. No." The allegations were first raised last month by an alleged victim. Sixteen women have filed complaints with prosecutors seeking investigation. The prosecution has assigned the case to the police, banning Lee from leaving the country.